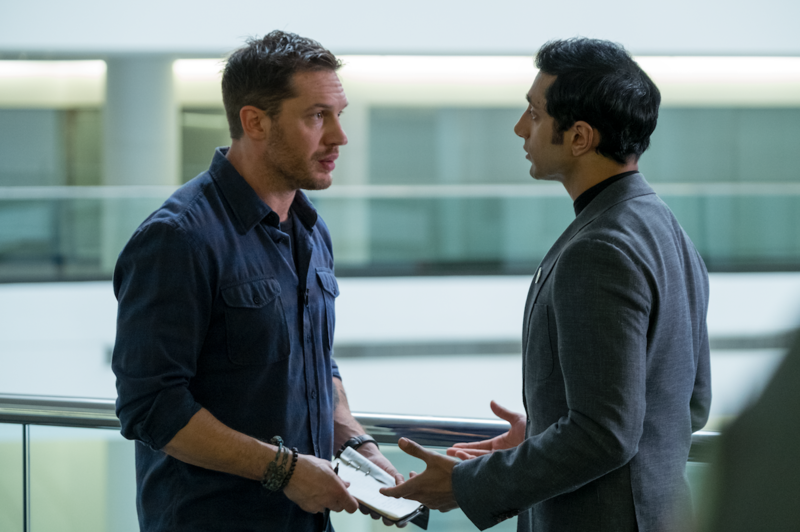 Tom Hardy shines in what's essentially a dual role — "We are Venom" indeed. Apparent creative differences between Hardy and director Ruben Fleischer (“Zombieland,” “Gangster Squad”) aside, “Venom” leans closer toward the former — a potential franchise-starter whose bizarre incongruities ultimately feel more like a feature than a bug. All is well with Eddie Brock when first we meet the mild-mannered reporter, who takes his investigative duties seriously and relishes speaking truth to power. This is occasionally to the chagrin of his boss, whose latest assignment is of the puff-piece variety: a profile of high-tech entrepreneur Carlton Drake (Riz Ahmed). The genius inventor is of the opinion that human beings are a weak, imperfect species, and so he looks to the stars for an answer to our earthbound woes. What he finds is something different, of course. The film begins months before Eddie and Venom become one, when a rocket carrying an alien lifeform harvested from a comet and soon to be known as the symbiote crash lands in Malaysia. A parasitic being that imbues its host with superhuman abilities even as it slowly kills them, it’s described by Drake — who funded the cosmic expedition and will soon begin testing the entity on human subjects — as something like an organ transplant: If the symbiote and its host aren’t a perfect match, the body will reject it and eventually die. Neither Michelle Williams (as Eddie’s love interest) nor Jenny Slate (the scientist who tips him off to what Drake is doing) is given enough to do, but Hardy commits fully to what’s essentially a dual performance. His nonpareil approach to accents remains intact, with Eddie’s all-American speech patterns contrasting sharply with Venom’s extraterrestrial bellows; we’re constantly made aware of the ways in which they both are and aren’t in harmony, with a push-pull tension ideally suited to a character who resides uncomfortably in the grey area between hero and villain. Conspicuous in his absence is Spider-Man, the yin to Venom’s yang, but the film doesn’t suffer for it. The two nemeses going at it in a future installment seems inevitable, but a mid-credits scene makes plain that Spidey isn’t the only foe worth getting excited about. It’s no spoiler to say that Ahmed emerges as the antagonist here, resulting in symbiote-on-symbiote combat that quickly turns into a web of flesh, tendrils, and fire. It’s a remarkable visual display, as awesome as it is off-putting. “Venom” opens nationwide this Friday, October 5.